It’s been ten years since the R52 MINI Convertible was launched and a new MINI model was born. Since that time we’ve driven every model variation from the very first 2005 R52 to the latest JCW Convertible (across the US during MTTS no less). And then there’s the full-on love affair we had with our long-term JCW Roadster last year. Through it all we’ve grown to love open-top motoring and the visceral qualities it brings to an already emotional driving experience. As much as ten years is worth celebrating, there’s something else happening here. 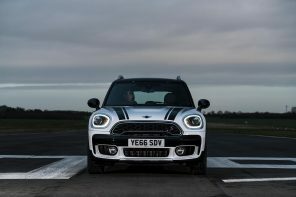 MINI is subtly prepping us for the all new F57 MINI Convertible. That car will debut next February at Geneva and should hit dealers sometime in late Spring worldwide. Much like the R52 and R57 before it, the F57 will make use of a dual stage top, four seats and a fold-down rear boot. However it will also leverage all of the advancements that the F56 brings with more power, more efficiency and greater technology on-board. Read on for the full press release covering the last ten years of MINI Convertibles. Official Release: Summer’s most seductive herald appeared just a few weeks before the start of spring. 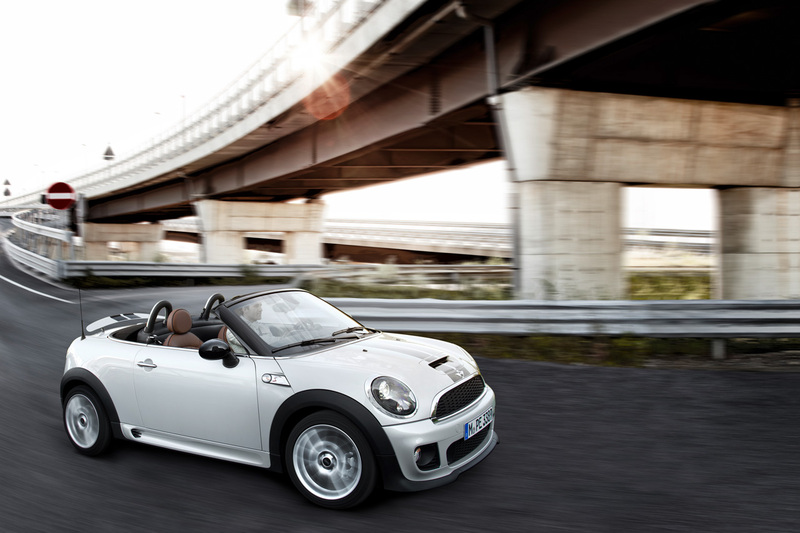 The MINI Convertible first hit the spotlight at the Geneva International Motor Show at the beginning of March 2004. For ten years now, the 4-seater open-top version of the British premium brand has been letting the sun shine in along boulevards and country roads all over the world. From the very beginning, the MINI Convertible stood for refreshing openness, individual character and yet also a clear brand identity. Its upright windscreen ensured that the driver, front passenger and rear passengers instantly found themselves sitting in the open air as soon as the textile top was opened. Short overhangs at front and rear, large wheel arches, the height of the shoulder line and numerous hallmark brand design elements left no doubt as to the kinship of the open 4-seater model. And thanks to a precisely defined roof shape, the characteristic MINI proportions were instantly recognisable when the soft top was closed, too. Typical MINI: characteristic proportions, clever details. But the MINI Convertible’s distinctive charisma was by no means solely due to its design. Its premium quality – unique in the segment of small open-top cars – and its clever functionality likewise instantly enhanced its individual flair. In the very first generation of the MINI Convertible, for example, the soft top with its electrohydraulic roof mechanism could either be fully opened at the press of a button or else moved back in the front section by just 40 centimetres. Ever since then, this sliding roof function has enabled a carefully controlled supply of fresh air at speeds of up to 120 km/h. The MINI Convertible was similarly flexible from the outset when it came to performing transportation tasks. The downward-opening luggage compartment tailgate, the Easy Load System with the upward-tilting roof frame and the foldable rear backrest all offered an unusual degree of versatility in this area. With such a diverse array of strengths, the MINI Convertible soon became a global success. The quality and popularity of the open-top 4-seater also meant it was quick to achieve a high level of value retention. It was in 2007 that the MINI Convertible first achieved top position in the “Value Master” ranking published by the automobile magazine “Auto Bild”. Since then the model has established a tradition of top placements in this ranking that is continued to this day by the current generation of the MINI Convertible. New generation perpetuates success story. The latest edition of the agile sun-worshipper went on the market in 2009, right on time to mark the brand’s 50th anniversary. With evolutionary design advancements reflecting an even sportier style, more powerful and also more efficient engines, a more refined premium-style interior, an optimised all-round view and numerous innovative equipment features, the new MINI Convertible now perpetuates its predecessor’s success story. A single-section, almost completely invisible roll-over bar which only extends when needed combined with increased body stiffness makes for further progress in the field of safety. Its high-quality textile top features improved acoustic properties as well as an electrically heatable glass rear window. 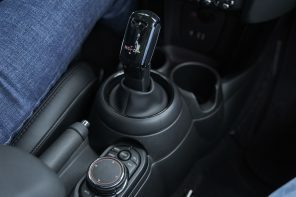 It can be opened and closed in 15 seconds at speeds of up to 30 km/h. The Always Open Timer was introduced as a new and likewise unique function. It measures open-top driving time to the nearest minute. The sliding soft top function has been retained as has the flexible load concept. The tailgate now has inside hinges and storage volume has been increased: to between 125 and 170 litres when driving with an open top and 660 litres when the roof is closed. The range of engines has also been significantly expanded since the change of generation. 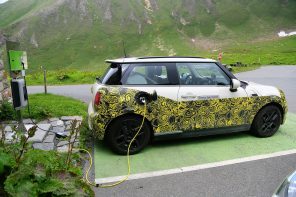 There are currently three petrol and two diesel engines available for the MINI Convertible: The program ranges from the MINI One Convertible with 72 kW/98 hp and the MINI Cooper D Convertible with 82 kW/112 hp to the MINI Cooper Convertible with 90 kW/122 hp, the MINI Cooper SD Convertible with 105 kW/143 hp and the MINI Cooper S Convertible with 135 kW/184 hp. What is more, the open-top 4-seater is also available as an extremely sporty top-class athlete. The MINI John Cooper Works Convertible generates intense enthusiasm with its 155 kW/211 hp turbo engine. 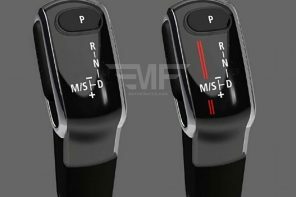 All engines are combined as standard with a 6-speed manual transmission, while a 6-speed automatic transmission is available as an optional extra. Driving fun in the open air: a speciality of the classic Mini, too. Even classic Mini fans were unable to resist the attraction of open-top driving in the long run. However, it took the founding father of all modern small cars at least three decades before its creative space concept eventually included unhindered access for the sun and the wind. A convertible based on the classic Mini first saw the light of day in 1991 and was the work of the German Mini dealer Lamm in Kappelrodeck. With its reinforced sills and an integrated cross-member, the quality of the car’s body conversion suitably impressed those responsible at Rover headquarters in the UK. As a result, the decision was made to produce a series of 75 classic Mini Convertibles for the domestic British market. The classic Mini Convertible was developed by Rover Special Products and Karmann (Germany) and was presented to the public for the first time at the British Motor Show in Birmingham in October 1992 before going into production at the Mini plant in Longbridge. 1,081 specimens of the open-top classic were built there up until August 1996, all of which are now highly coveted rarities. Model-specific front and rear bumpers, flared wheel arches and sill trim elements gave it an exclusive appearance which was underscored in the interior by means of trim strips and a gear lever knob made of burr walnut, a leather steering wheel and a velour carpet. The open-air version of the classic Mini came in in two paint finishes: Nightfire Red with matching red top or Caribbean Blue with a grey top. In 1995 the blue body finish was replaced by the colour British Racing Green. The model made do with just one type of engine under the bonnet: the 63-hp 4-cylinder in the Mini Cooper ensured flair and a refreshing airflow. The convertible version of the classic Mini was fitted with a manually operated soft top while an electrical mechanism was available as an optional extra. Open-top driving fun: an integral part of the MINI model program now for ten years, reinforced by the MINI Roadster. After the relaunch of the brand, much less patience was required of open-air motoring fans than in the era of the classic Mini. The MINI Convertible celebrated its debut just three years after the closed 3-door model went on the market. It has now defined the culture of open-top driving in the small car segment for a decade, having become a key linchpin within the brand’s model program. The great importance of open-top driving to MINI today is reflected in the fact that the elegant 4-seater has since been joined by the purist, sporty and likewise refreshingly open 2-seater. The MINI Roadster is the perfect supplement to the brand family. Featuring two seats and a manual or semi-automatic soft top, it stands for a spontaneous fresh-air experience and thereby successfully follows the path previously smoothed by the MINI Convertible as the open-top original in the premium small car segment.